What is another word for deterrent? 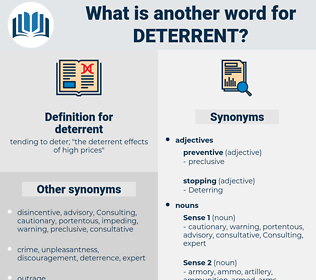 tending to deter; " the deterrent effects of high prices"
impediment, discouragement, hindrance, obstacle, intimidation, containment, threat, hurdle, constraint. dissuasive, deterrence, disincentive, dissuasion, crackdown, preventive. assistance, incentive, encouragement, catalyst, help. permissive, aid, boost, stimulus, spur, break, handmaiden, benefit, advantage, edge, impetus, goad, stimulant.
" The infliction of flogging," he argues, undeniably answers in these cases, both as a sharp and effectual punishment, and also as a deterrent from future misdoing. The difficulties - sometimes there were even serious difficulties - of visiting places where there was neither provision nor protection made for the stranger, always acted upon him not as deterrent but incentive: he liked something to overcome, and found the safe, comfortable, convenient resting - places as uncongenial to his nature as they were unproductive for the purposes of his work. 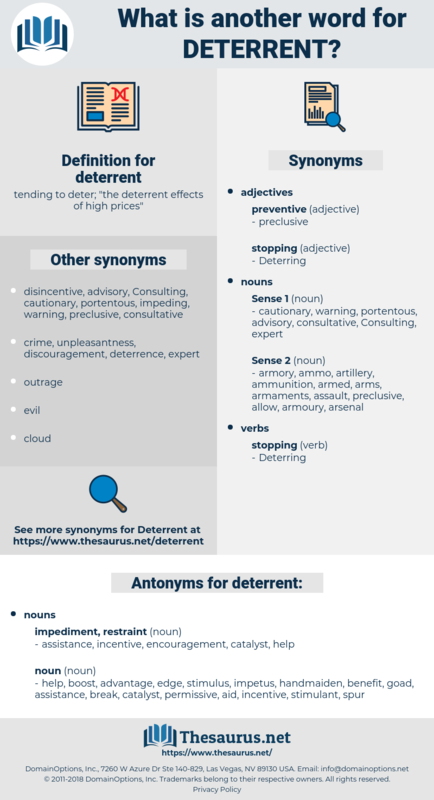 determinate, dry mouth, determinant, deer hunt, doormat, deodorant, drum out, durant, death warrant, determined, drumhead, deodourant, drained, drowned, dreamed, drawn-out, dethronement, dry unit, dairymaid, detriment, darned, dormant, durante, deerhound, drown out, durum wheat, determent. drag, obstruction, diriment impediment, bind, albatross, straitjacket, millstone, obstacle.